Founder of Faith In God Eagle Life Assembly Prophet Blessing Chiza has issued a controversial prophesy that for Zimbabwe to be prosperous God is going to install Nelson Chamisa as President of the country. In the same prophecy he said God wants President Emmerson Mnangagwa, Kembo Mohadi and Constantino Guvheya Nyikadzino Chiwenga to be born again. Chiza also said the country will be ungovernable unless there is dialogue between Chamisa and Mnangagwa. 1. What's happening in Zimbabwe is spiritual judgement that needs to be solved spiritually because the elections were not handled well, especially in the area of fairness/ credibleness, though there was a certain degree of peacefulness and freeness during elections. So, God is not happy with the way elections were done. This election had God inside and four words were supposed to be carried out (peaceful, free, fair and credible). The throne of Zimbabwe has a curse sitting on it right now and it needs to be cleansed spiritually. No matter which systems they use. Plagues are judgements. So, until that is sorted we will continue seeing Zimbabwe moving in circles. No matter how much you dream or wish for Zimbabwe to change, there are some things that need to be done to cleanse the throne. Zimbabwe will still be in the same position until certain spiritual measures are taken to cleanse the throne. Many other things have been there for a long time but what is striking Zimbabwe right now is what I am telling you. 2. The Lord says, Top Government Officials of Zimbabwe must stop consulting traditional healers/ witchdoctors/ mapostori (James 4vs8). If they want transformation, they must go to Pentecostal Churches/ Anointed Man of God (Deuteronomy 18vs9-14). You are buying poverty and curses on top of curses that were already there. I hope this message will go to the leadership of this nation, they must stop consulting witchdoctors and going too much to mapostori. This country is experiencing a spiritual problem and you cannot solve a spiritual problem using economics. You can try and try but nothing will change. 3. I was given verses James 4vs6/ James 4vs17 and the Lord said President E.D Mnangagwa must pray and humble himself for the sake of Zimbabwean people he is leading and have a dialogue with Advocate Nelson Chamisa for this economy to change, because if there is no dialogue the people of Zimbabwe will continue to suffer. It's a spiritual thing. They must stop saying that Chamisa is young. Be humble our honourable President and do the right thing says the Lord. "They know", says the Lord that it is the right thing to do and are simply resisting. It's a sin. 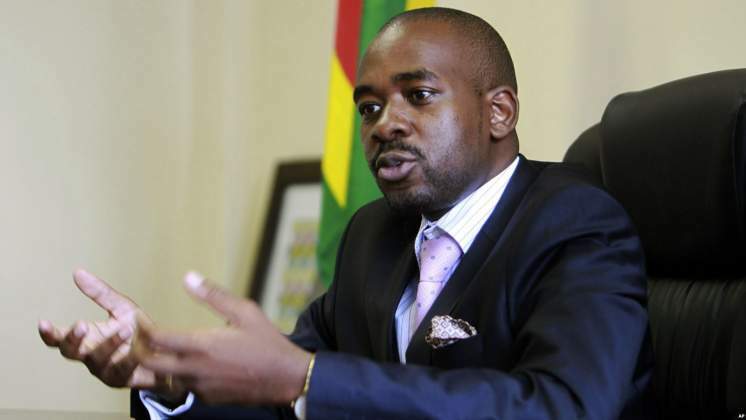 As a prophet God shows me that Chamisa has a small key that he was given by God which is very powerful in the spirit. They must know that he is spiritually deep/mature; a born again and spirit filled Christian and he is an anointed man of God. Once they start dialoguing, we will start to see things changing in this country. If that dialogue does not happen the baby that I saw in that previous prophecy, will be taken deeper into the sea- Zimbabwe will go to a point of no return. I think Ramaphosa understands what I am saying. Once God sees that happening, you will see fuel coming back among other negative things being corrected. There is something powerful that is of God in him. If the presidium does not heed this instruction, I saw Zimbabweans becoming very impatient, and protests that have never been seen in Zimbabwe arising which shall bring the whole nation out and they will send the government resigning because some of the people will not leave the streets demanding food from the president. No soldier/police will be able to stop that because the multitude will be beyond human control and measure. I saw people marching and staying in streets for 3-5 days saying, "We will not leave until the president resigns". If this does not happen by June, Zimbabwe will stand still. The poverty will be worse than 2008. Food will be there but poverty will be attacking people. Especially the youth; I saw them running with empty plates that are rusted saying, "give us food”. A point where this country will be ungovernable. 4. I am not giving the time frame but you will see it happening, a wave that is going to come into Africa of new young presidents and it's of God. God was removing old presidents, it was like their era in the spirit has passed, countries like Nigeria, Cameroon, Uganda, South Africa and Zimbabwe. It shall be a revival, they will improve Africa and will run countries with digital E-Government, these countries shall be a marvel again. They will remove systems of rigging of elections and Africa shall be respected again. I see this happening soon in God's time and season. I see the Lord saying, "tell my people in Zimbabwe to believe in Me, to go to church more in 2019 and listen to my word, they shall survive with my grace, from the pulpit and not from the parliament because nothing shall come from there for now. I repeat again, nothing shall come from there for now”. 5. The Lord says His Excellency President E.D Mnangagwa, Vice-President Chiwenga and Vice-President Mohadi must be born again and start to learn to love God in 2019. I received (Proverbs 9vs34/ James 4vs8). This must be done to attract righteousness, you must start to love God and to attend church, Pentecostal and not maspostori. Be born again, not maZion. I repeat again ED, Chiwenga & Mohadi be born again in 2019. If you think we are young go to elderly Men of God like Baba Guti. 6. 1 Chronicles 28vs2/ Deuteronomy 28vs2-3. All men of war stop fighting for presidium because you will never prosper Zimbabwe if you just hear someone with a title of 'war something' know that it will be difficult to have prosperity with that person. Zimbabwe, you must know that if these people come it will be poverty after poverty. You will not build Zimbabwe because you have been a man of war. Give young people who did not fight war. So intercessors pray so that God may shine His light into their hearts so that they understand that the people of Zimbabwe have suffered too much. 7. Pray against suicide. I saw an increase of suicides in 2019. Prophet instructed the church to pray against the spirit of suicide. It will be too much, many people hanging themselves, drinking poison, shooting themselves and taking drugs because of economic hardships. God was saying, "pray in a serious way because it can attack your family member". I was seeing a lot of people hanging on trees and some being put in metal coffins, no matter how much you suffer, never commit suicide. You would rather pray under a bridge having nothing, suicide is demonic and it's the easiest way to hell. 8. Then the Lord said to me in about five visions and they came continuously to me. The Lord said, there is a man whom God is raising; a young president who shall bring economic and spiritual revival in Zimbabwe in God's time and the Lord showed me his inauguration in the National Sports Stadium. For God to confirm, when it is the time for that inauguration, heavy rain is going to fall. And this man's first name starts with an N and a surname which starts with a C. Initials are N.C. He shall be put by God. Demons will try many things to stop his presidency, trying to change presidential age limit/ to arrest/ death/ but finally he shall be inaugurated. Demons can sense his favour and moment hence they will panic. President Mnangagwa has his time and we honour them and their dispensation with his Vice-Presidents but this N.C's time is coming just as their time came. (Zechariah 4vs6) Read it to people. He is going to come by God's power. I hear some say this N.C will never rule Zimbabwe, because he is young. But the Lord is saying they are saying out of their fleshly desires but God Himself shall shock many. When God says yes, no-man can say no. He will be in power. Not by might/ not by the barrel. "His hands are clean", says the Lord and God says I have anointed him for his time and his hands are clean. Coated in Minerals. Visionary leader 2020 mind. Anointed of God/ God fearing. People shall leave diaspora to return to Zimbabwe when he begins ruling. In this time we shall see spaghetti roads, forex, nice buildings that you see in Hong Kong, Singapore and Indonesia. The main reason the man N.C is coming is for a spiritual revival which will see many people coming to Christ. He will make Zimbabwe great again and he will break demonic altars in Zimbabwe and we shall be the bread basket of Africa. There shall be a spirit of prayer in Zimbabwe that will sweep over the whole country. You shall not hear of bloodshed again in Zimbabwe. Zimbabwe shall be a united, loving and peaceful country. His other name shall be Solomon and he shall reduce gold to be common stones (1st Kings 10vs27). During his reign, Zimbabwe shall discover a lot of minerals, employment rate will go above 70% (2nd Chronicles 1vs15/ 9vs27). Soldiers, police, nurses, doctors, teachers and all people shall be smiling. There is a wave of peace that shall sweep over Zimbabwe. God has not forgotten Zimbabwe the question is when is his time, it can be any time, though it might be sooner, or nor sooner or later, or next election or before. But what I am simply saying is that God said to me it shall be in My time and right time. Why not now? Why not last year? Number= There are still numerous animals-there are still animals, corrupt animals that are big that this person was not going to be able to deal with but God put these people so that they deal with each other and it creates a highway for N.C. There were too many beasts in the field, its Gods way (Exodus 23vs29-30). Now I know many people will criticise and speak, but isn't it time is available, let's wait for time and see if I didn't hear from God. Now, let's pray, but I said the main reason is for a revival, a spiritual revival that must come to Africa through Zimbabwe. It shall come like a veld fire and Zimbabwe will start to prosper in way that shall shock many people. Everyone has his time. Now you are allowed to argue with me and I as a prophet I am allowed to argue and say my prophecy will come to pass. And I am not saying this to please anyone, to attack anyone but I am just transmitting what God wants me to say. I have been criticised before, but people still see my prophecies coming regardless of their criticism. The same way we were shocked how Mugabe left power is the same way some will be shocked how he got into power. It has its time. God bless you as you enter the year 2019, lead by God's word and prophetic direction.